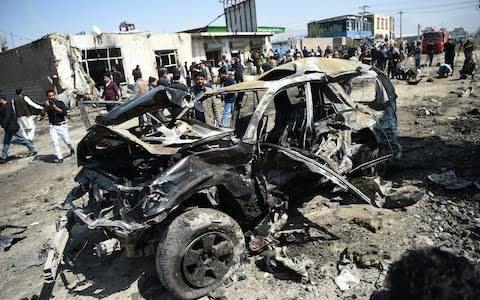 At least four people were killed and more than 50 wounded when a bomb-laden car blew up near a highsecurity compound in the Afghan capital Kabul on Monday, officials said. "Most of the victims were civilians," said Najib Danish, an interior ministry spokesman. Police spokesman Basir Mujahid said a vehicle full of explosives had been detonated. "The area is cordoned off ... and search operation underway for suspects and attackers" "It was a powerful car bomb that knocked (down) a wall between Green Village and the customs office," a security source said. The latest attack comes as US special peace envoy for Afghanistan was touring the region for meetings aimed at bringing an end to the 17-year war in Afghanistan.